Dion Phaneuf got the ball moving on what is expected to be an eventful NHL trade deadline. Some insiders are anticipating more activity — perhaps much more — than the hockey world has seen in recent years. 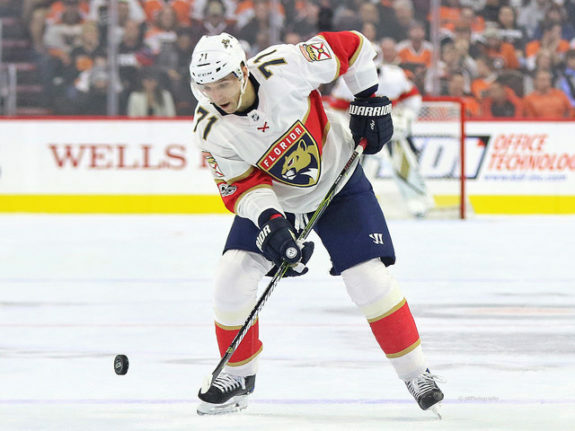 With the playoff races so tight in both conferences, there are a lot of prospective buyers — ranging from ambitious to aggressive — and there are at least a couple sellers looking to blow it up. The Ottawa Senators were one of them — the New York Rangers are the other — and sending Phaneuf to the Los Angeles Kings was likely just the start of wholesale changes in Canada’s capital city. That four-player deal — Nate Thompson is accompanying Phaneuf to L.A. in exchange for Marian Gaborik and Nick Shore — was also a good start for my big “On The Block” list, previewing the Feb. 26 trade deadline by ranking 210 players in terms of their perceived availability. All four of those names were on my list, published Feb. 11, with Phaneuf and Thompson ranked as 7 out of 10 — meaning they had a 70 per cent chance of getting traded — while Shore was a 5 and Gaborik a 4 thus 50 and 40 per cent, respectively. Going 4-for-4 on the first trade made me feel like a genius, then suddenly it was 7-for-7 once Nikita Soshnikov (8) was sent to the Blues and Chris DiDomenico (6) was swapped for Ville Pokka (6) in a pair of minor deals. Yes, those three were on my list too — all above 50 per cent, no less — but it’ll likely be all downhill from here. I’ve never been a Nostradamus, but a lack of success hasn’t deterred me from publishing my annual trade deadline predictions. Truth be told, I’m 3-for-120 since 2014, including 0-for-26 in 2017. Last year was so shameful that I didn’t even revisit the results, but hopefully I can redeem myself or at least rebound to some degree in 2018. Not all 210 players from my list will be traded, obviously, and there won’t be 100-plus moves before the deadline. Half that many, at most, but I suggested the over/under could be safely set at 40, which is significantly higher than usual. As in 40 from Feb. 11, or starting with the Phaneuf trade — not 40 on deadline day alone. Tempted to take the over, I decided to go with 40 on the nose and here is what I dreamed up. Go ahead and tell me to “keep dreaming . . . ” in the comments below! Rick Nash is considered the biggest fish available among the unrestricted free agents at this year’s deadline, but who will be reeling him in? Drum roll . . . ANALYSIS: Nash was the first of nine players that I featured in a “3 Potential Suitors” mini-series previewing the deadline, so let’s start there. The Sharks were my top suitor and I still see San Jose as the best fit, even though Nashville, Tampa Bay, Dallas and others are rumoured to be in the running. I like Nash to the Sharks because of his chemistry with Joe Thornton from international tournaments and San Jose clearly needs another top-six winger after converting Brent Burns back to a forward when Tomas Hertl got hurt. The Rangers waived the rebuilding flag for their fan base, so that is obviously the plan. Sorensen is signed through next season and could play up and down the lineup, but the keys to this return are Norris, the 19th overall pick in 2017 who starred for Team USA at this year’s World Juniors, and Gambrell, the 60th overall pick from 2016 who turns 22 in August and could be NHL-ready sooner than later. Gambrell isn’t a household name because he was a late second-rounder, but he’s looking like a steal as one of the best players in college hockey. Norris is enjoying a strong freshman NCAA season as well and the Rangers love their college forwards — see Chris Kreider, Kevin Hayes and Jimmy Vesey. Depth down the middle has been a weakness for the Rangers, but Norris and Gambrell are both centres — Norris is left-handed and Gambrell is right-handed — to complement their own 2017 first-rounders in Lias Andersson and Filip Chytil. The conditional third would become a second if the Sharks advanced to the Western Conference final and a first if San Jose goes all the way to the Stanley Cup Final. 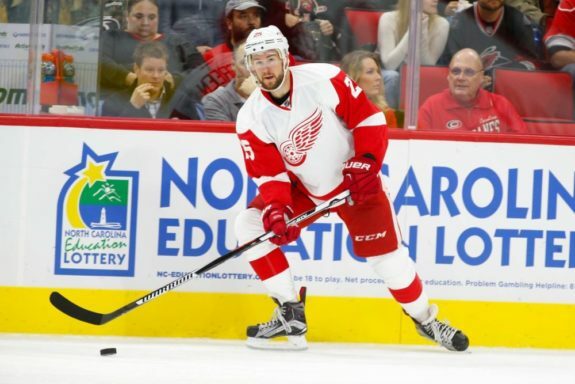 Mike Green represented the Detroit Red Wings in the All-Star Game this year, but he’ll be finishing the season with a new team. ANALYSIS: This may become a trend but, again, Washington was my top suitor for Green. This would be a steep price to pay — arguably even steeper than Kevin Shattenkirk at last year’s deadline — but the Capitals are in a position to go for it again and they know what they are getting this time in Green. He should be able to make a seamless transition back to Washington and really bolster that defence. The Capitals wouldn’t want to lose both Johansen, their first-rounder from 2016 (28th overall), and their top pick in this year’s draft, but there will be a bidding war for Green and the Red Wings will be wanting quality over quantity in return. Washington might be willing to offer both Jonas Siegenthaler and Connor Hobbs in order to keep Johansen, but Detroit will be in the driver’s seat in these negotiations and Washington will do what it takes to get its man in Green. If it takes Johansen, so be it. Chorney is just a salary and contract dump for the Capitals as a pending UFA. Evander Kane has cooled off in 2018, but the market should still be hot for this power forward. ANALYSIS: Shockingly, Pittsburgh wasn’t one of my suitors for Kane, but it wouldn’t be surprising to see Jason Botterill help out his old team. Kane could be the perfect wingman for Sidney Crosby on the left side, while Botterill would be very familiar with Sprong’s upside and may prefer him to the Penguins’ first-rounder in 2018. Matt Hunwick is looking like the odd-man out on Pittsburgh’s blue line — rather than Ian Cole — and there would need to be a significant salary heading back to Buffalo. The Sabres’ defence is still in shambles and Hunwick is a serviceable veteran signed for two more seasons. However, his inclusion in this deal is more of a favour from Botterill to his former mentor Jim Rutherford. 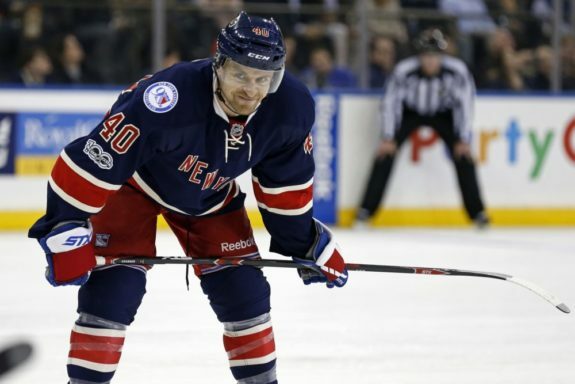 Michael Grabner scored two more goals on Saturday and is now up to 25 on the season. Is that enough to fetch a first-round pick for the Rangers? ANALYSIS: The Kings were one of my potential suitors for Grabner and now that they have acquired Phaneuf, it does appear that Rob Blake will be a buyer. Grabner’s speed is something of a need for L.A.’s forward group, whether he’d be flanking Anze Kopitar or Adrian Kempe once Jeff Carter returns to That 70s Line. With Phaneuf in the fold, the Kings are deep on defence and LaDue could be expendable, along with defence prospect Anderson. Both are NCAA products, which the Rangers do seem to gravitate towards. LaDue will be a restricted free agent looking for a one-way contract and would compete for a role with the Rangers next season as a 26-year-old, while Anderson only turns 19 in May and will be a few years away. By parting with Anderson, the Kings are able to keep their first-round pick. Thomas Vanek is no stranger to moving at the deadline and his bags will be packed again this year, expected to be traded away by Vancouver. ANALYSIS: Likewise, the Predators were one of my suitors for Vanek, but I failed to mention Pettersson as part of the projected return. Pettersson is the older brother of Vancouver’s top prospect, Elias Pettersson, so that would make sense. Emil is 24 years old, but he’s looking like a late-bloomer with impressive AHL numbers during his first season in North America. Farrance might be the better prospect in this package and seems to have good offensive upside as a puck-mover despite a lacklustre stat-line as an NCAA freshman. Jim Benning may target prospects rather than picks for Vanek, so Nashville could be a good fit. David Poile is said to be pursuing Nash but, failing that, Vanek could be a fallback plan for the Preds as another scoring winger. 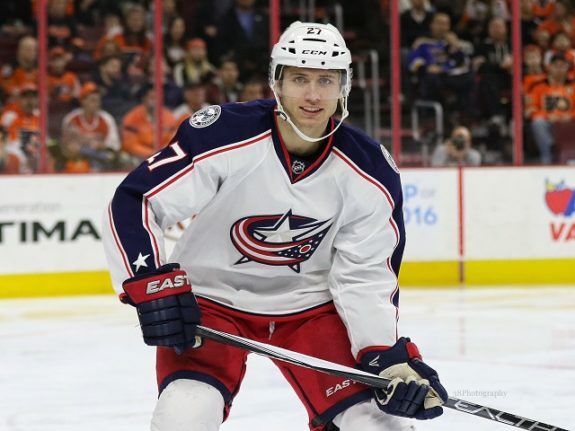 Jack Johnson wants to be traded and he should get his wish, but it remains to be seen what that return will look like for Columbus. ANALYSIS: I threw out this idea in suggesting Minnesota as a suitor for Johnson and I still like it. Columbus wants a forward back — preferably a centre — and would covet Coyle. Minnesota needs a defenceman, at least short-term while Jonas Brodin is sidelined, so Johnson would plug that hole nicely. If the Wild are simply renting Johnson, with no intention of extending him, then this deal only makes sense to Chuck Fletcher if Jenner is part of the package to replace Coyle going forward. Quincey is a throw-in, a pending UFA that would be a depth option on defence for Columbus just like last year when the Blue Jackets acquired him from New Jersey at the deadline. 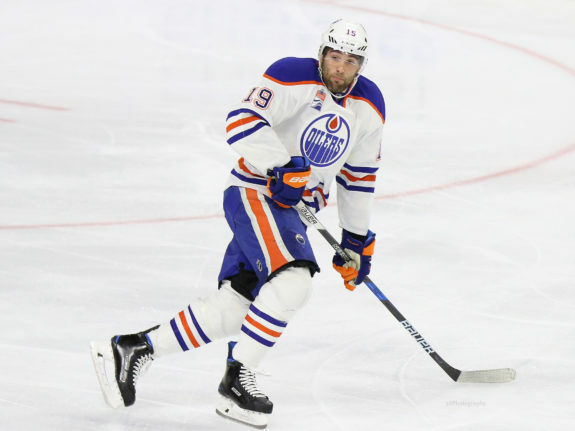 Patrick Maroon has exceeded expectations with the Oilers, but Edmonton underachieved as a whole this season and changes are coming again. ANALYSIS: Tampa was my top suitor for Maroon, reuniting him with former junior coach Jon Cooper. The Lightning have plenty of prospects to interest the Oilers if Edmonton prefers a player over a pick. Stephens is a right-handed centre who plays a 200-foot game, kills penalties and wins faceoffs, plus he can score too. The Oilers have decent prospect depth on the wings, with Jesse Puljujarvi, Kailer Yamamoto, Tyler Benson, Kirill Maksimov and Ostap Safin on the way. So a centre makes more sense, especially if Leon Draisaitl is going to flank Connor McDavid again next season. Winnipeg’s Nic Petan could be another option if that is what Edmonton wants. Mark Letestu had a career year last season, but he’s had his struggles like most of the Oilers this season and it appears Edmonton will forge ahead without him too. ANALYSIS: Pittsburgh was my top suitor for Letestu, taking him back to where he started his NHL career. 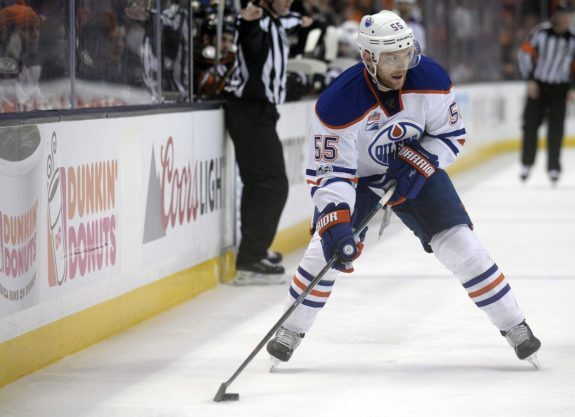 Edmonton again targets players rather than picks, seeing Simon as another possibility for next season’s lineup. He’s right-handed and was drafted as a centre but has been playing wing in Pittsburgh, getting a spin on Sidney Crosby’s line. Rowney is a salary dump and a pending UFA, but he’s another right-handed centre and an Alberta boy who might be worth a look for Edmonton. Erik Gudbranson (44) won’t be acquired for his offensive contributions, but he’ll be high on the list for teams looking to solidify their defence. 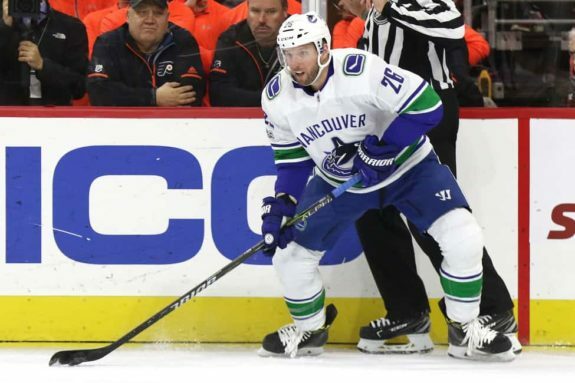 ANALYSIS: Toronto was my top suitor for Gudbranson and Grundstrom strikes me as another target for Jim Benning, similar to last season’s deadline when he got Jonathan Dahlen from Ottawa for Alex Burrows. Vancouver has always had success with Swedish forwards, so that trend continues too. The second part of the trade is a little uncharacteristic in that Toronto would receive a third-round pick if the Leafs don’t re-sign Gudbranson. Typically, it’s the other way around, with Vancouver getting the conditional pick if Toronto were to re-sign Gudbranson. Instead, the Canucks agree to take back a contract and opt for Nielsen as a promising defence prospect. There is growing speculation that Erik Karlsson could actually be traded by Ottawa ahead of the deadline, so I couldn’t resist taking a crack at what it would take to land him. 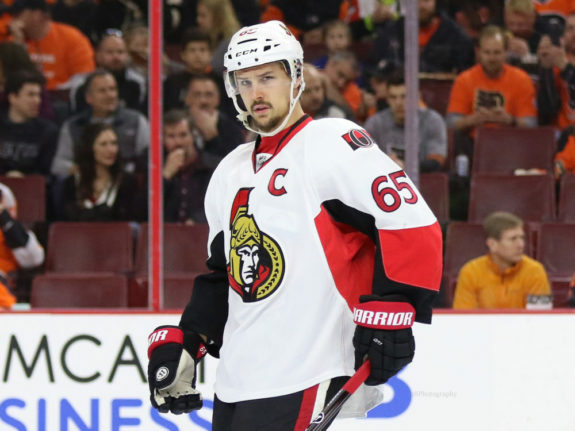 ANALYSIS: This would be a massive blockbuster and it would take that kind of massive package to pry Karlsson out of Ottawa. The Lightning have the assets and the Senators would have to listen. Steve Yzerman could go all-in on Karlsson, who is signed through next season, and landing him would make the Lightning undisputed Stanley Cup favourites for 2018 and 2019. If Yzerman somehow found a way to re-sign Karlsson, then Ottawa would also receive Tampa’s 2020 first-rounder. The Senators would be assured of six assets, including a skilled centre in Johnson, who is signed for six more seasons at a reasonable $5-million cap hit. Koekkoek is from the Ottawa area and still has nice upside as a potential partner for Cody Ceci. Hájek and Cernak could form another pairing for Ottawa in the not-too-distant future. Cirelli is leading Tampa’s farm team in scoring as a first-year pro and he’s another Ontario boy to boot. The Senators also get a late first-rounder in this year’s deep draft. 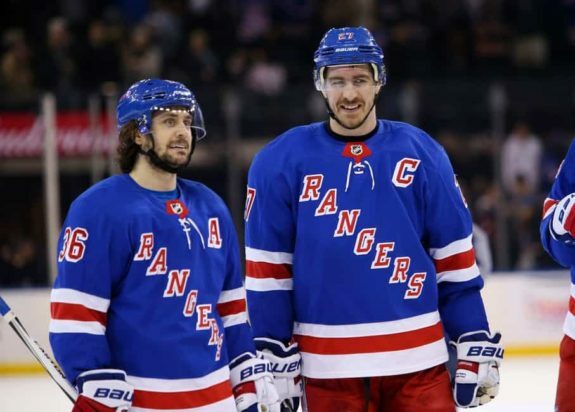 Ryan McDonagh, right, and Mats Zuccarello have been a big part of the Rangers’ success in recent years, but they could both be a thing of the past in New York sooner than later. 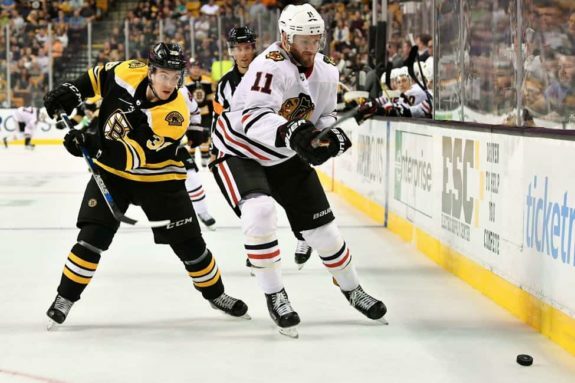 ANALYSIS: This would be another whopper, turning the Bruins into legitimate contenders. Like Tampa with Karlsson, Boston has the assets to go after McDonagh. Don Sweeney doesn’t want to part with DeBrusk, but apparently he’s the player the Rangers are coveting in return. The Rangers continue their rebound by acquiring two more NCAA prospects with obvious NHL upside. Donato is playing for Team USA at the Olympics and could debut for the Rangers shortly thereafter providing they can get him signed. If that’s a concern, Jeff Gorton may demand Trent Frederic instead of Donato. Either way, the Rangers would be adding a few players capable of filling key roles when they are ready to compete again. The first-rounder would certainly be another quality prospect. ANALYSIS: Sticking with the Rangers, they are shopping Zuccarello as well and the Blues could use another scoring forward. Jaskin hasn’t scored enough for St. Louis and may be used as bait to acquire somebody more proven. Thompson and Walman are two more college alums that could step in sooner than later for the Rangers. Holden is a pending UFA who can provide depth, at least until Joel Edmundson is healthy again. ANALYSIS: The Stars will be another team trying to add more skill on the wings and trying to find a linemate for Jason Spezza. Jim Nill’s history with Detroit might make Nyquist the preferred target. Ritchie could use a change of scenery and Tufte is a project with a fairly high ceiling. 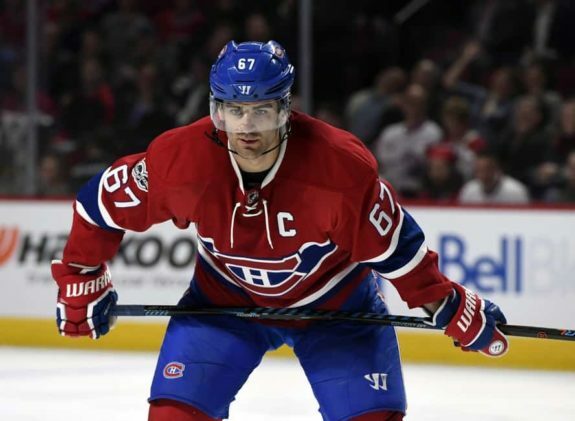 Max Pacioretty hasn’t been showing up on the scoresheet lately and his leadership has been called into question, but Montreal’s captain hasn’t forgotten how to score goals. He’ll figure it out again, but it may be somewhere else. ANALYSIS: Yes, a rare three-way deal. Arizona gets Pacioretty to pair with Derek Stepan for next season and Gillies becomes the Coyotes’ goalie of the near future — an upgrade on Scott Wedgewood, Adin Hill, Hunter Miska and Marek Langhamer. Calgary gets Domi and Rieder to play with Sam Bennett on a third scoring line, acquiring two players that Brad Treliving would be familiar with from his time in Arizona. Montreal gets two much-needed centres with debatable upside, two higher-end defence prospects, and three good darts for the draft — that Calgary third turns into a second if the Flames make the playoffs this year. That may seem like more quantity than quality for the Canadiens, but it’s seven assets for one — quite similar to what Colorado fetched for Matt Duchene. ANALYSIS: Marc Bergevin and Ron Francis could be two of the most motivated general managers at the deadline, with Bergevin getting a vote of confidence to blow up the Canadiens and Francis getting the green light to use up his wealth of cap space — turning the Hurricanes into more of a win-now team. My predictions would have both GMs accomplishing their goals. Galchenyuk would give Carolina another scoring threat and Shaw would fill a hole at centre while bringing more Cup-winning experience from Chicago. Montreal arguably does better here than in the Pacioretty deal, getting two Francophone forwards in Roy and Gauthier who could form a dynamic duo for years to come, plus another first-round pick to build around. Jooris is a pending UFA and a contract dump for Carolina. 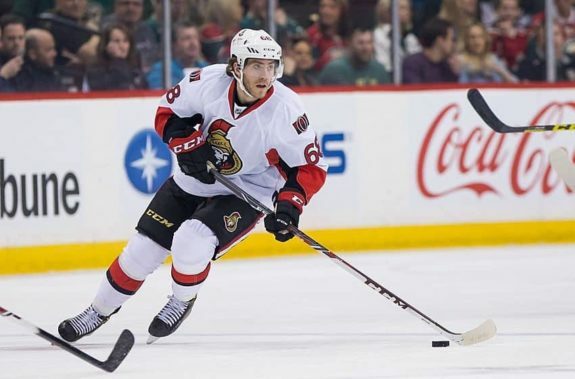 Mike Hoffman is one of the few Ottawa players producing offensively right now — developing chemistry with Matt Duchene — but that hasn’t stopped his name from making the rounds in the rumour mill as the deadline approaches. ANALYSIS: If the Senators are going to move Karlsson, it may as well be a mass exodus and a total rebuild. To the contrary, if the Hurricanes are going to try to become a legitimate contender, they should also target another shooter up front and Hoffman is red-hot right now. Oduya has a ton of playoff experience and two Stanley Cup rings, so he’d help solidify Carolina’s bottom pairing — bumping Klas Dahlbeck and Haydn Fleury from regular duty. Hoffman has a team-friendly contract for two more seasons, so he wouldn’t come cheap. Kruger is a salary dump the other way, but Necas and Bean are both top-15 picks who could make an immediate impact for Ottawa next season. ANALYSIS: The Jets want to roll three scoring lines come playoffs and Brassard would give them another offensive-minded centre with plenty of post-season experience. Brassard is a proven playoff performer, so he’d be a solid addition and has another year left on his contract too. Matthias would be a salary dump as a pending UFA, but Petan could step right in for the new-look Sens. Stanley is a unique defender and a towering presence that might remind some in Ottawa of the Zdeno Chara days if he continues to develop upon turning pro. Harkins is a decent prospect too but projects as a depth player. These aren’t Winnipeg’s best prospects, but Ottawa is also getting a first-round pick in a stacked draft. ANALYSIS: The Ducks could use another centre with Ryan Kesler labouring and Antoine Vermette slowing down with age. Pageau would bring more pace, but could also pair with Vermette to form an effective fourth line. Brown and Grant, both pending UFAs, would offset that salary, while Roy and Blandisi would get more opportunity in Ottawa next season and be cheaper options for the Senators going forward. ANALYSIS: A simple 1-for-1 swap of somewhat similar players, with Smith further along in his career and ready to help the Devils in their playoff push but also signed for three more seasons. Quenneville will be ready for a regular role with the Senators next season and can learn the NHL ropes from a fellow Brandon Wheat Kings alum in Mark Stone, who will be staying put at the deadline and becoming one of the key leaders for Ottawa. 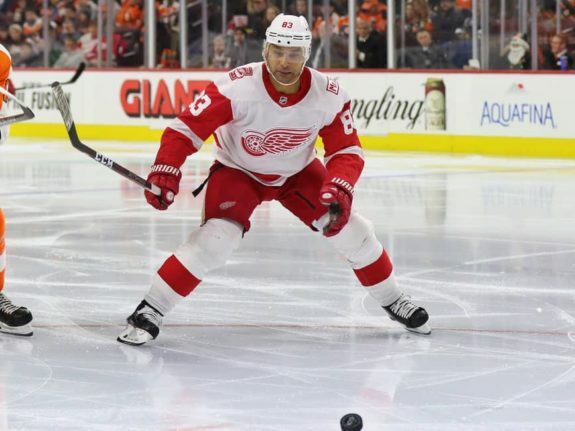 Trevor Daley surprised some by signing in Detroit, but his stay there could be short-lived. ANALYSIS: Garth Snow is going to want to make some noise as a buyer at this deadline. He may not be interested in rentals, but Snow knows he has to improve the Islanders’ roster for their playoff push and to help convince John Tavares and Josh Bailey to stick around long-term. This move could help on both fronts. Daley has won two straight Stanley Cups with Pittsburgh and is signed for two more years on a cap-friendly contract, so his experience would prove invaluable in solidifying the Islanders’ defence core that lost Calvin de Haan to a season-ending injury. Athanasiou is a streaky player, but he’s also one of the fastest players in the league. Doug Weight could surely find a fit for Athanasiou in the top nine, ensuring three scoring lines. Detroit is going to be rebuilding and receives four nice assets for the future, including one of the Islanders’ two first-round picks in this year’s draft — the higher of the two, unless it’s a lottery pick. Ho-Sang and Dal Colle could both use a change of scenery and a fresh start in another organization as first-round picks who are still finding their way in the pro game. Vande Sompel is a swingman, capable of playing defence or forward, but more of a rover who is enjoying a solid season as a rookie pro. 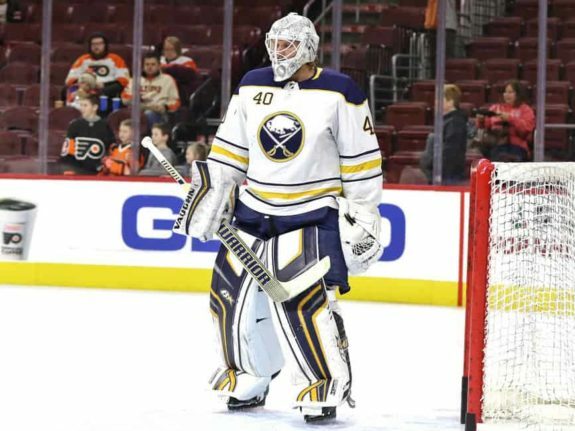 Is Robin Lehner part of the solution in Buffalo or part of the ongoing problems with the Sabres? That’s debatable, but it sure sounds like he’s available. ANALYSIS: If there is a goalie trade to go down at the deadline, this one seems the most likely. It may depend on Brian Elliott’s recovery more than anything, but Ron Hextall probably sees a little of himself in Lehner. Neuvirth isn’t consistent enough to backstop the Flyers into the playoffs, but he’s signed through next season and thus would have to go the other way. The Sabres would take on Neuvirth but be targeting Lindblom as a player for next season. ANALYSIS: The Flyers will be in the market for a defenceman, preferably a right-handed one. Pysyk fits the bill and he’s got two more years remaining on his cap-friendly contract, so this is a longer-term investment rather than a rental like Gudbranson. Pysyk isn’t flashy, but he’s really steady and effective. However, he’s not one of Dale Tallon’s boys, having been acquired from Buffalo when Tallon was bumped to the background for Florida. Since returning as GM, Tallon has been undoing most of those moves. Alex Petrovic would be the other option for Philadelphia, but he is one of Tallon’s boys. Morin, a lefty and an imposing physical specimen, might be more to Tallon’s liking. The Panthers could also use more centre prospects and Vorobyov has nice upside as a playmaker. Ryan Murray hasn’t had much to smile about in Columbus and he might be happy with a trade. There’s no indication it will happen, but the Blue Jackets would likely be willing to listen on offers. ANALYSIS: If Columbus is moving Johnson, Jarmo Kekalainen might also be searching for a replacement. Scandella has arguably been Buffalo’s best or most consistent defenceman all season long — logging top-pairing minutes for the most part — but the Sabres are in next-year mode now and Murray would be an enticing reclamation project for Phil Housley. A change of scenery could really benefit Murray, who has had no luck on the injury front in Columbus. Scandella would be a solid addition for the Blue Jackets, with two more years on his contract and less injury risk. Columbus’ fourth line is also a work in progress, with Girgensons and Josefson potential upgrades on Lukas Sedlak and Jussi Jokinen. Josefson is a pending UFA, but Girgensons has a year left on his deal and, like Murray, could also do better elsewhere. As mentioned, Buffalo is focused on the future and Milano would be another piece to that puzzle as a high-skill forward. ANALYSIS: A swap of Swedish centres, with Lindberg one of the few expansion draft selections that haven’t panned out for Vegas. Larsson could be a slight upgrade and he’ll still be a restricted free agent following next season whereas Lindberg will be unrestricted. So Vegas tosses in a fifth-rounder to balance the deal, an expendable asset since the Golden Knights also own Montreal’s fifth-round pick for 2019. George McPhee doesn’t want to give up futures for rentals but should be looking to better his first-place team, so this trade is a nice compromise. ANALYSIS: Glendening to Toronto is widely rumoured, given his history with Mike Babcock. He has three more years left on his contract at a decent cap hit for a fourth-line centre. Leivo has requested a trade after being passed over by Kasperi Kapanen for playing time and there should be a bit more opportunity for him in Detroit. Ditto for Marincin on defence, having been banished to the minors in January, and also for Johnsson, a talented 23-year-old Swede who has yet to make his NHL debut despite leading the Marlies in scoring. Johnsson is essentially a point-per-game player in the AHL and would have a better chance of finding a role with the Red Wings. Toronto will be trying to shed some contracts at the deadline, so this 3-for-1 would accomplish that. ANALYSIS: Martin’s homecoming isn’t going as hoped in Toronto — much like David Clarkson’s didn’t — but he’s still a cult hero within the Islanders’ fan base, so he’d be welcomed back with open arms to rejoin Casey Cizikas and Cal Clutterbuck on the fourth line for a couple more seasons. Chimera is a pending UFA that Toronto would be taking back to offset the salaries for this season — who knows, he might be able to play a role for Babcock — but the Leafs wouldn’t be able to dump Martin’s contract that easily. They would have to sweeten the pot a little, so the Islanders take a chance on Rychel, who doesn’t appear to be in Toronto’s plans going forward. The Islanders also get a token fourth-rounder, which they don’t currently have for 2019. Tomas Plekanec has carved out an impressive career with the Canadiens, but his time could be up in Montreal as a pending unrestricted free agent. ANALYSIS: The Bruins could use another centre as a rental and they have seen lots of Plekanec over the years. Everything that could go wrong has gone wrong for both Vatrano and the Canadiens this season, so they could be a good match in hopes of rebounding next season. There aren’t many centres — especially UFAs — available on the market, so Montreal forces rival Boston to throw in a second-rounder. ANALYSIS: If the Bruins are bringing in McDonagh and Plekanec, they may as well keep buying and add some depth for the postseason. Hansen hasn’t been a great fit for the Sharks — he’s even been a healthy scratch at times this season — but he should have some good hockey left in him. Czarnik is leading an AHL team in scoring and producing at better than a point-per-game pace, but he’s 25 and hasn’t been able to stick with the Bruins through three pro seasons, so he could be a career minor-leaguer. Both these players could do better in a different situation. 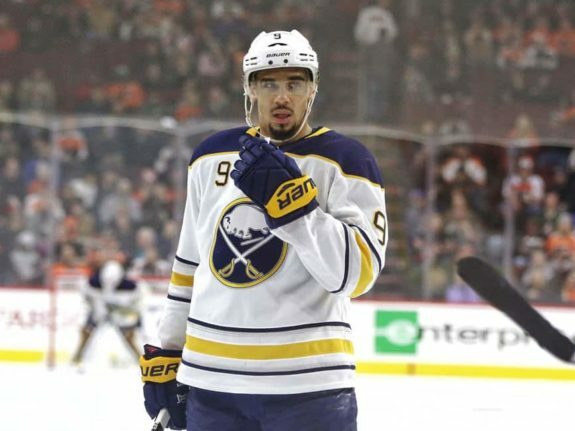 ANALYSIS: Swap of left-wingers with the Kings getting a pending UFA who can help now and fits the style of their forward group, while the Sabres get a fast prospect with a scoring touch for the future. Wagner is intriguing but likely a few years away. ANALYSIS: Another depth forward for the Kings, capable of playing their heavy game. In exchange for Bouma, a pending UFA, the Blackhawks gets the rights to Prokhorkin, a 24-year-old who has been reluctant to leave Russia but has been productive in the KHL this season. 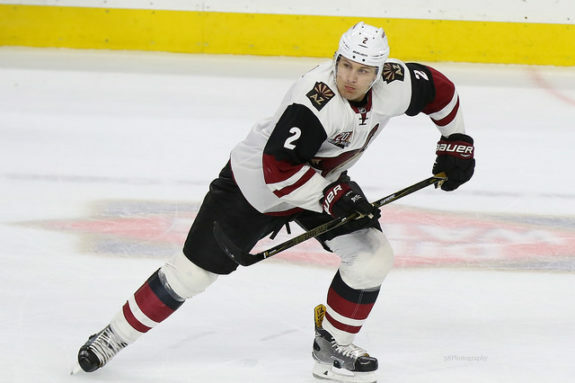 Does Radim Vrbata have anything left in the tank? Florida doesn’t seem to think so, but some other team will probably take him for a test drive. ANALYSIS: Another former Coyote for Treliving, a buy-low move that may or may not help Calgary’s playoff chances. Vrbata can score or could score, but he appears to be on his last legs as a frequent healthy scratch in Florida. The Panthers get back a pick they burned to buy Jiri Hudler from the Flames at the 2016 deadline. ANALYSIS: Swap of pending UFAs who could be jumpstarted or rejuvenated by a change of scenery. ANALYSIS: Another depth move for the Penguins, acquiring a versatile forward in Richardson, a pending UFA who may or may not find a role for their playoff run. Corrado didn’t fare any better in Pittsburgh than he did in Toronto, but maybe Arizona will have an NHL roster spot for him next season. He’d likely get a late-season audition anyway. Brayden Schenn has blossomed into a star and a first-line centre for St. Louis, but older brother Luke Schenn is still bouncing around and will be landing somewhere else at the deadline. ANALYSIS: Dallas could use another depth defenceman, especially a physical stay-at-home type like Schenn in case Marc Methot’s health doesn’t hold up for the playoffs. If Methot is good to go, Schenn might not suit up much for the Stars, but a third-round pick is worth the insurance policy in this case. ANALYSIS: Stacked as they are on the blue line, the Predators are still looking for the right fit on their third pairing. Connauton, a pending UFA, has been hot lately and teams should be taking notice of his improved play and production. He’d be a buy-low option for Nashville. Arizona scouts the WHL heavily and watched a lot of Kirkland when he was in Kelowna with Nick Merkley. They could be reunited in Tucson. ANALYSIS: Colorado could use another veteran on defence and Gorges is still a battler who would be willing to bleed for the Avs to get into the playoffs. Nolan would provide some muscle if needed. Gorges and Nolan are both character guys with playoff experience, good additions to the dressing room even if they don’t have much impact on the ice. If Colorado makes the playoffs and those two suit up for a combined four or more games in the first round, that pick would be upgraded to Colorado’s third-rounder in 2019. The Avs also own Ottawa’s third-round pick in 2019, so that wouldn’t be a huge loss if these two help get them some wins. Cody Franson had his moments during a brief stint with the Blackhawks, but Jordan Oesterle stole his roster spot and Chicago demoted him. ANALYSIS: More experience on the back end for Colorado’s playoff push, even though Franson got pushed to the minors in Chicago. Siemens is a borderline bust who just got called up, presumably for a brief showcase before a deadline move, but he won’t fetch much based on his career to date. 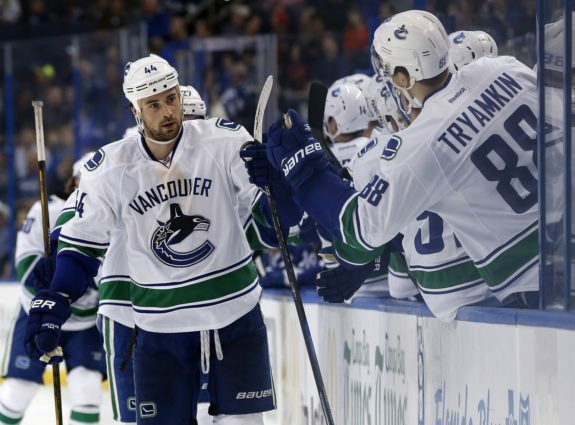 ANALYSIS: Hutton got plenty of power-play time to start this season in Vancouver but wasn’t able to make the most of his opportunity and now could be on the move. New Jersey targeted Mueller ahead of the expansion draft, but he’s failed to establish himself as an NHL regular there. Hutton and Mueller have both been healthy scratches lately and both are signed through next season — Hutton at $2.8 million and Mueller at $850,000 — so this swap could work out for both teams. The Devils have the cap space for Hutton, who is more proven than Mueller at the NHL level. ANALYSIS: The Wings are apparently looking to give Ouellet a fresh start and the Sharks aren’t overly deep on the back end. San Jose could be a good landing spot for him, and likewise for Heed, who could see more power-play time in Detroit next season. ANALYSIS: Swap of Quebec-born prospects, both drafted in the second round in recent years — Fucale was taken 36th in 2013 and Roy went 31st in 2015. San Jose could use another goaltending prospect and Fucale is stuck behind Carey Price, Charlie Lindgren and now Michael McNiven on Montreal’s depth chart. Roy has had a rough go with injuries the past couple seasons, losing valuable developmental years, but he’s still a decent defence prospect. Well, what do you think — which trades could come to fruition and which trades are too farfetched? Feel free to weigh in and share your own predictions in the comments below.